While I was driving down to the newspaper office near the waterfront I drove past this scene of an automotive version of Noah's Ark. It looked just perfect for the world we now are living in. 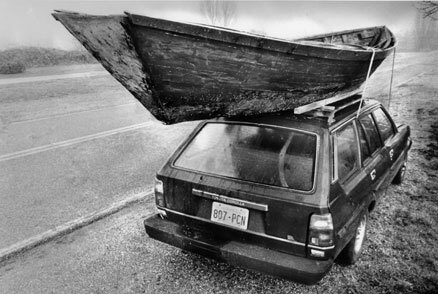 The skiff which hangs over the Toyota wagon 3 feet front and back must weigh a ton because it has already caved in the roof a couple of inches. This underpowered car boat is overweight on the road but lends plenty of tire traction on our wintertime ice and snow road conditions. When I start thinking about this unusual mode of mobility new concepts and varied applications seem endless. I mentioned the traction advantages but then you see that you can drive to the shore and take the auto dory to sea, literally. Once the windows are closed tight you could probably travel pretty well on water. This is really a perfect escape pod for today's end of world scenarios as this multi-terrain vehicle would handle floods and tsunamis like a breeze. You would sure save time getting in and out of disasters. The only draw back would be the cost of fuel and high wind factors when making sharp turns or quick stops. I assume the boat was in transit but I wonder if someone saw what I saw?